What if Oregon would have come out victorious against Ohio State? 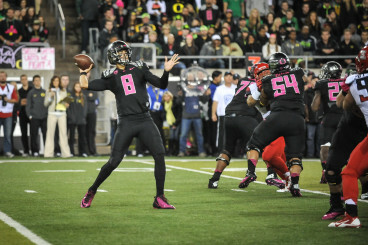 What if the Ducks’ front seven didn’t get pushed around by the Buckeyes’ offensive line? Maybe things would have turned out differently if Oregon had found a way to plug up Ohio State’s running lanes. There’s no doubt that last season’s accomplishments were outstanding, but as the Ducks continue to prepare for the 2015 season, there seems to be a question mark hanging above their heads. Oregon has one of the most successful football programs in recent memory. Since 2009, Oregon has won 70 games, and only one other team in the nation has eclipsed that mark. The Alabama Crimson Tide has won 72 games during that span and three national championships, as well. While it may be difficult to argue against Alabama and Nick Saban, there is no question that the Ducks have been one of the most, if not the most exciting team to watch over the last six years. But how much longer will the Ducks keep riding this magical wave? I have learned quite a few things over the last few years, but there is one thing that sticks out to me vividly: never count Oregon out. When critics claimed that the Ducks were ‘too soft,’ they kept winning. When Chip Kelly left the Ducks and bolted for the NFL, they kept winning, and when star players like LaMichael James and Kenjon Barner left the program, the Ducks just kept on winning. No matter how big the obstacles have been, Oregon has found a way to maintain its dominance, both nationally and within its conference. The Ducks’ ability to overcome personnel and coaching changes has been impressive, but there’s a part of me that’s feeling a little skeptical for next season. Not only did the Ducks lose in the national championship game this past January, but they lost something even bigger that night: the pillars that have kept this program standing on solid ground. In the last five years, the Ducks have seen a handful of players that have meant a whole lot to the program. 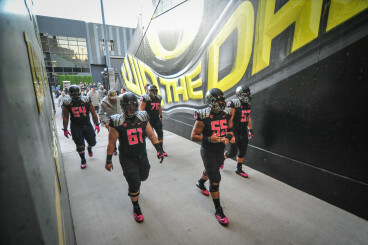 Guys like Hroniss Grasu, Ifo Ekpre-Olomu, Erick Dargan, Tony Washington, Derrick Malone, Jake Fisher, Hamani Stevens, Keanon Lowe, Arik Armstead and Troy Hill were all important contributors to Oregon’s success. It will be difficult to replace the leadership, character, toughness and talent that each of those individuals possessed. The offensive line will look a lot different next year, and it’s no secret that Oregon’s up-tempo offense depends heavily on the success of its offensive line. Also, while there won’t be too many changes to the defensive line, the Ducks’ secondary and linebacker positions received a huge blow this offseason. Fortunately, however, the men in green and yellow have a slew of young players that will step in and fill the vacant positions, but there is one player in particular that will be impossible to replace: Marcus Mariota. From 2012-2014, Mariota dazzled college football fans all across the country, and not only was Mariota Oregon’s first Heisman winner, but he capped off his college career by producing one of the best, if not the best statistical season by a quarterback in college football history. 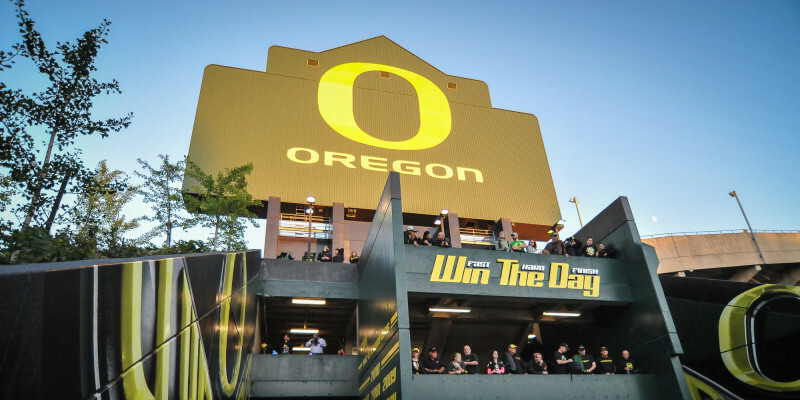 There’s absolutely no question that Oregon’s pillars have been damaged, and when you consider the overall improvement of the Pac-12 as a whole, it looks like the Ducks will have a lot of competition as they continue to move forward. Who knows, maybe I’m just overreacting. What if the Ducks come back next season and shock the world? I guess we’ll have to wait and see.